SECO/WARWICK is proud to announce the creation of SECO/Vacuum Technologies (SVT), a new company designed to provide standard and custom vacuum furnaces and related professional services to the North America market. 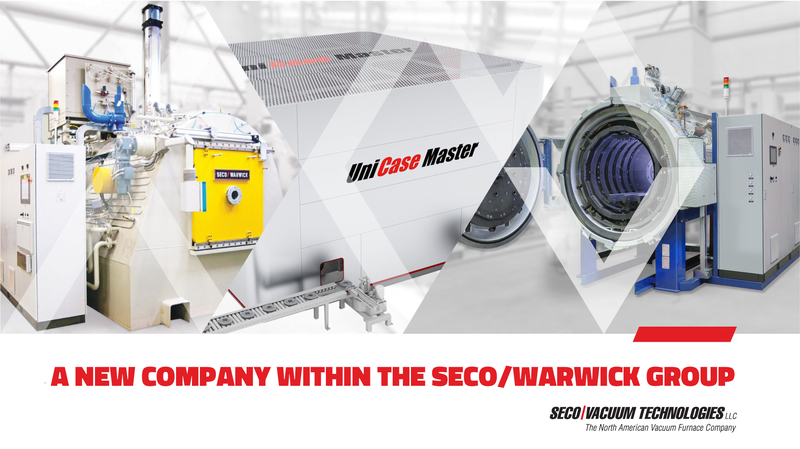 With nearly 400 vacuum furnaces installed in North America alone, SECO/WARWICK is already a well-established vacuum furnace brand working tirelessly for commercial and captive heat treaters every day. Through the creation of a company dedicated to the unique requirements of our North American customers, SECO/Vacuum Technologies (SVT) will improve delivery of the world’s best technology and configure it for seamless compatibility to American standard components and controls. Specific Vector models in the most popular sizes and quench pressures will be available through VIP program. SECO/Vacuum Technologies LLC is a fully-owned entity of SECO/WARWICK Group in Europe. Through technological leadership, SVT offers unmatched vacuum furnace innovation and performance; and through its commitment to service, SVT provides its customers with the best support in the industry and the lowest cost of ownership.